Squeeze Squeezy’s tummy and you’re in for a surprise! 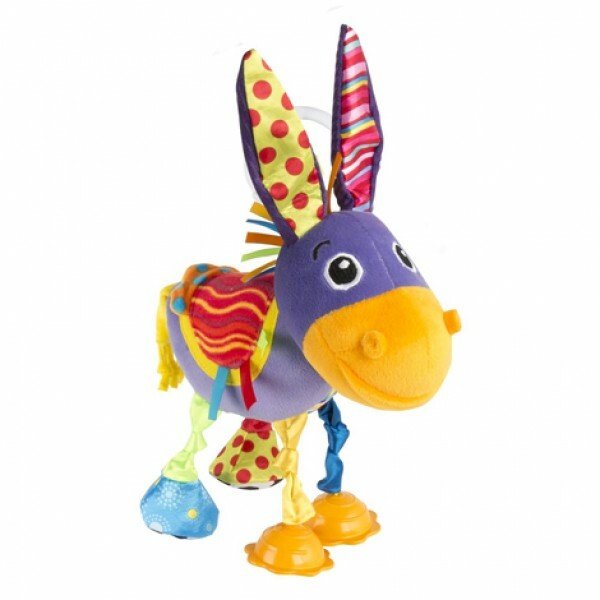 This little donkey from the Lamaze stable will pop up his ears every time! With hours of cause-and-effect play in store, there’s much more to discover. Squeezy has a velvety purple coat, and amazing patterns hiding in wait beneath his ears. He’s dressed in a stripy blanket to keep out the cold and comes complete with a ribbon mane they'll want to groom, a shaggy tail and tassels that are safe for baby to chew on. With so much to stimulate the senses, you can play along with baby as you make Squeezy’s crinkle feet and clip-clop hooves trot noisily along! And to make sure he never gets left behind, parents can tether him to cots or pushchairs with the handy multi-purpose hoop. Ideal for babies from birth upwards.